Startups know that SEO matters, but what they also know is that you need to get your company in front of the right people at the right time. For a small startup, this is key to survival. What a lot of startup don’t do is leverage everything within their power to control their brand and put the most important information about them front and center when potential new customers (or investors) have heard the brand name and conduct a search online. What a lot of startups also don’t do is be sure that when they are using paid acquisition to grow, which can be a dangerous proposition because when your budget dries up so does your company, they do not also leverage SEO to lower their cost per click on branded keywords. Here are some easy tips for startups to implement to improve their chances of being found online and at the same time control their brand. Through creating these profiles and linking to and between them where possible, you can control your startup’s message to the world. If you’re doing paid acquisition especially, you know where your traffic and conversions are coming from. While you can pull many levers on your site to improve your bounce rates and increase your conversion rates, one of the best ways to improve your company’s profitability and lower your cost of acquisition is to drive organic traffic for those same keywords. Of course, some keywords are as competitive in organic search as they are expensive in paid search, but studies have proven time and time again that when you both rank for a keyword organically AND bid on it with Adwords, your CPC goes down and clickthrough rate from organic is higher. This is especially true on branded terms. If you are an ecommerce site or running offers which you use paid traffic to monetize, also ranking #1 in organic is crucial to making as much money as possible. Take for example Julep, which is a makeup company based in Seattle. They have a free box offer, where one can sign up to get a free box of cosmetics (and then continue to receive a box every so often by mail). Women love Julep, and I have no doubt that the Free Box is a very successful offer for them. 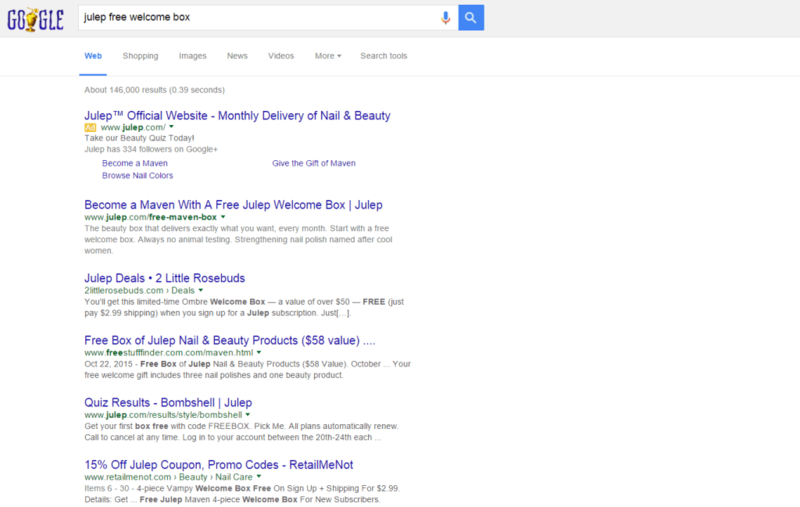 However, take a look at the search for [julep free box offer]. 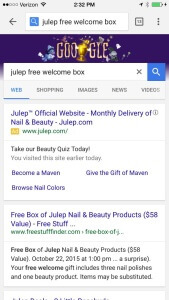 The first and second organic results are not in fact Julep, but rather affiliates that make money from driving traffic that converts to Julep. Julep ranks #3 in organic, but they are the only paid result (luckily for them). However, I’d be willing to wager that much more of the traffic coming to their page comes through paid than organic, and they are actually costing themselves money directly by allowing those affiliates to outrank them. Here’s what this search SHOULD look like on desktop. Some of you might be familiar with the term “online reputation management” or ORM, which simply refers to the practice of making sure that the information you want ranking when people search for you gets found. While ORM has received a bad rap over the years because companies with bad business practices have used it to hide the truth from customers, there are many good reasons to control exactly what people see about you when they search. Imagine that you are a new startup who is raising funding. Because you’re transparent about everything in business, you tell the world that you are raising money everywhere that you can think of, especially Angellist and Crunchbase. On a different note, imagine that a nefarious competitor of yours writes a smear piece against you that starts ranking for your brand name. All of a sudden, you have negative press appearing when potential customers (or investors!) search for your brand name. So what can you do? You have two options – get positive press coverage on strong websites to crowd out the negative press, or build links to the positive mentions of you that already exist. The best, of course, is to control your brand by consistent brand storytelling (your “why” to your company’s existence) and making a point to link to your positive brand mentions whenever possible, especially from coverage on other sites to help push up your positive brand mentions that can tell your brand story through your branded search results. Of course, ORM is tough. 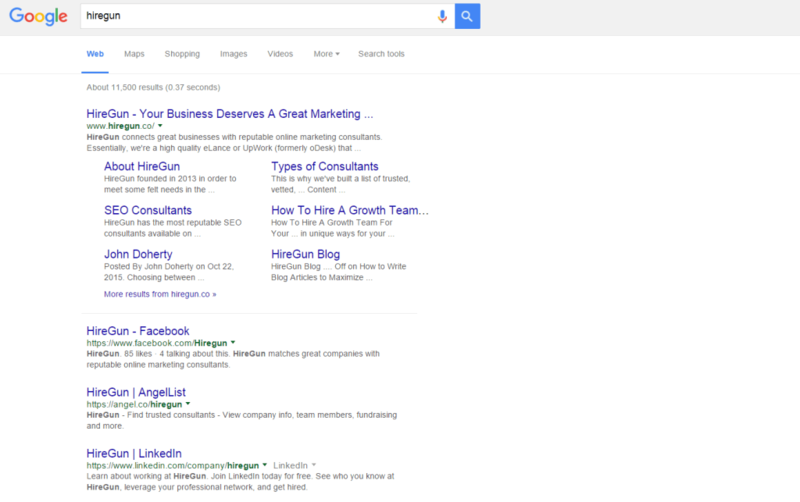 When doing regular SEO, you are trying to rank one page better. When engaged in ORM, you are trying to get 10 different pages ranking and push down the pages you do not want in your search results. To learn more about ORM, here is a great start. 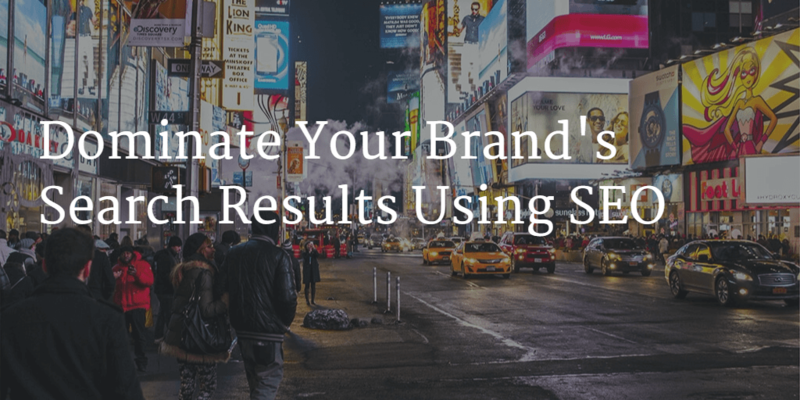 How else have you used SEO to dominate your branded searches?